Have you been wondering how to use all those cucumbers we’ve received in the past two weeks? Wonder no more—CSA Chef demos return to this week‘s pickup! Chef Daphne will be on deck with some ideas for your share. Stop by for some yummy samples and tips between 5pm and 7pm. On the counter: Tomatoes, Acorn & Sweet Dumpling Squash ** see note below about squash! What a great share this week! 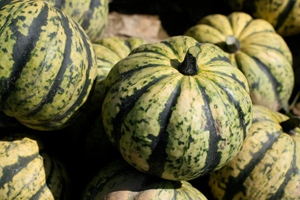 **A quick note on the winter squash… They should be stored on the counter, but eaten within 1-2 days. We’ve had some disease issues with these plants and have noticed that many of the squash have been rotting prematurely. So be sure to eat them right away! Baby farmer is just starting to eat solid foods and as of last night, his favorite is the sweet dumpling squash! I would have to agree—it is absolutely delicious! The best way to prepare the winter squash is to wash the skin well and cut in half lengthwise with a knife. Scoop the seeds out of each half and place face down in a baking dish with a few tablespoons of water. Bake, uncovered in a 350F oven until the flesh is soft. Depending on the size and variety, this takes anywhere from 30-60 minutes. The farm has set the date for this year’s Harvest Festival, and though it’s not until October, we would like to start gauging member interest. We’ll have a signup sheet at this Thursday’s pickup, so if you’re interested in attending, be sure to put your name down- with enough member interest, we’ll organize a bus trip to the farm, as we did last year! Stay tuned for more trip info. Deadline to order your next delivery of Lewis Waite products is Mondy, August 26th for delivery on Thursday, August 29th. Note the NEW ORDER DEADLINES. Please be sensitive to the busy farmers and order on time. Late orders may not be filled! Place your order now! A quick note about the tomatoes… The cool, and now wet, weather, is affecting both the quantity (slowing the ripening process) and quality (many have developed cracks) of our harvest. 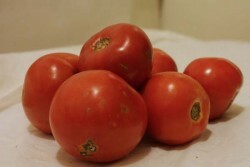 If you do receive a tomato with cracks, it is most likely just cosmetic and can be easily cut out without losing much of the flesh. 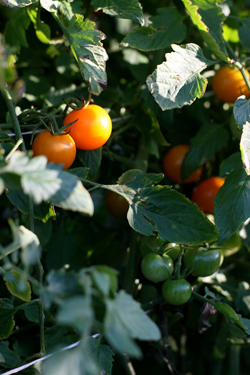 We’re hoping that along with the sun and warmer temperatures forecasted for later this week, our tomatoes will start ripening faster and we’ll have many more to distribute in the coming weeks! This week’s share reflects the ongoing transition from mid-summer crops to late-summer produce; Tomatoes have started to come in, albeit slowly, and we have Cucumbers galore! The weather has been absolutely gorgeous and relatively cool, particularly in comparison to July’s heat and humidity, but the trade off is that crops like tomatoes are taking a long time to ripen. As a result, the contents of this week’s share may fluctuate more than usual – please be sure to check back frequently for updates! And don’t forget, if you do not receive an item this week, we will work hard to try to provide it for you in the weeks to come. A few more specific notes about this week’s share: We continue to have plenty of Batavian Lettuce, Scallions, and Swiss Chard, which have all done very well this season. The cucumbers have really taken off in the past week, and you may notice that they’ve increased in size due to the recent rain we’ve had. The water also helps to make them crisp and crunchy! Purslane is new this week, and is a personal favorite for many of us here at the farm. We will continue to distribute Garlic periodically; it’s such a beautiful sight to see it hanging/drying from the rafters in our front barn and we’re just a little sad to see it come down (though we’re always happy to provide it to our members!). Finally, please be aware that many of the tomatoes have cracks or crevices. Much of this is directly attributable to the wet and cool period we had during pollination. They are still very tasty despite the occasional deformities, and we hope to have many more tomatoes in the coming weeks. The salsa verde recipe below is a wonderfully versatile relish that you can toss with boiled Potatoes (my favorite) or used as a spread on sandwiches, with eggs, tossed in beans, or a thousand other ways. You can make it with any assortment of green herbs, and this week’s Parsley and Basil would be a perfect combination! I’ve been making a simple Cucumber and Red Onion salad every few days since the cukes first started coming in from the field. Sometimes I add smashed garlic and ginger or chopped mint, but a basic mix of sliced cukes, sliced red onion, a splash of red wine vinegar and olive oil and salt & pepper to taste is my starting point. We’re hoping to harvest enough Watermelons for everyone this week, but there may be a few groups who don’t receive them. If that’s the case, don’t worry! We’ll be sending you some at a later date. After farmer Matt’s long newsletter last week, I’ll keep this short and sweet! We’re enjoying the more seasonable temperatures this week and our greenhouses are once again buzzing with activity. We’re getting all of our fall and winter transplant crops seeded into trays that will be transplanted out into the fields in another month or so. Our harvests are yielding some beautiful summer crops, including watermelons for most members this week. Be sure to refrigerate them immediate and eat them right away. Our melons don’t usually travel too well and if you find that yours has split, check inside to see if it is still ok – and if it is – eat it! Slight cracks to the rind are mostly cosmetic and don’t effect the flesh. (In past years some members tossed their melons because of a split rind without checking inside to see if it was still good. 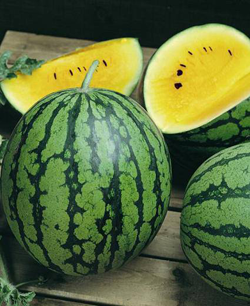 We don’t grow enough melons to replace many, so please be sure that you’re not throwing out a perfectly good melon!) Of course if your melon has spoiled, please let us know! Everyone seemed to find last week’s storage tips helpful, so I’ll try to include them in each newsletter from now on. All greens – Swiss Chard, Lettuce and the Green Cabbage should be stored in a plastic bag in the fridge. The Basil can be stored this way for a day, but if you want it to last longer its stems should be put in a glass (bouquet style) standing up in the fridge. The Cucumbers should be stored in the fridge, as should the Onion and the Potatoes, which are freshly harvested and will not store well in this heat. The garlic is fresh, so its skin has not fully dried out. This is a special hard-neck variety not found in stores. It is worth its weight in gold! We don’t grow much since the organic seed is very hard to come by in quantity, so savor it! It can sit on your counter for a week or so, but I would highly recommend using it with the basil for a delicious pesto! (Recipe below) I use pesto on pasta or as a spread on crostini or crackers as an appetizer. After a couple of lackluster weeks of harvests for the CSA boxes we have a lovely assortment of new crops to harvest and send out this week. At these times we get the feeling that some of our members think were playing a trick or game and hiding all our extra special delicious crops somewhere. It may be hard to believe, but even with our 70+ acres in production for CSA, it is possible to have very, very little to harvest at a particular point during the year. Almost always this is due to lengthy periods of excessively wet field conditions. Climatic conditions from June 7 through June 19th prevented us from working in the fields doing any kind of tillage, planting, weeding, fertilizing, etc. Most vegetable production is fairly complex, but growing for CSA is extra complex and demanding because of the need to continuously harvest and deliver a well balanced, diverse assortment of produce. With great weather this is already a significant challenge. With extended disruptions to planting and general field work it is not possible to come through with the intended crops at the desired time, thus leading to potential dissatisfaction when you pick up your shares. We always plan to plant a certain quantity of crops which relates to the number of members we anticipate signing up. What we actually harvest is a result of various things, but the largest deciding factor of what ends up in your CSA box is the WEATHER! For people whose daily lives are relatively unaffected by weather, this may seem mind boggling that the darn weather affects their CSA share. Farmers and field workers are intrinsically linked to the daily weather and how it affects them. In April and part of May we long for the awful Long Island wind to stop blowing from the East or the North, so we and the plants can thaw out. In the summer it’s such a rare treat to have a nice cool moist Easterly breeze, or a crisp North wind like we had this past Sunday. This past week we were lucky enough to enjoy high humidity and temperatures in the mid 90’s and the searing sun for more than 10 hours a day!!! But luckily there was a nice breeze for part of it. Talk about things that slow down production! Yes, the farm keeps on rolling, just a little slower. Which brings me to the main theme of last week… irrigation. That is about all I did last week – the whole week- plus a little tractor work. I think it’s been 3-4 weeks with no rain and the unirrigated parts of the farm are either dust or completely dried out vegetation. With heat like last week all of our crops need loads of water, so that’s what we must provide. Luckily we can, and we managed to do it. We irrigate with aluminum pipes with sprinklers that are hand moved from section to section, and also with a fair amount of drip hoses on crops like tomatoes and cucumbers. As you will see in your shares this week the cucumbers are very happy with the heat and the water they get from their drip lines. Now that we have watered the crops we need to start watering the other sections of the farm so we can prepare for our late summer and fall plantings. We appreciate your patience as we deal with the various weather issues that have affected the farm. We would also like everyone to share in the excitement of looking forward to the best months of the CSA season…coming soon! As always, everyone at the farm works diligently to uphold our end of the CSA relationship by growing as much high quality, nutritious, organic produce as we can. We also hope to bring some joy to your lives as we share this unique experience. Thank you for joining us for our annual cookout—what fun! Are you looking forward to the next CSA get-together? More CSA events coming soon! Contact us with pictures from the BBQ or suggestions/feedback for next time. I think it’s a good time to talk about veg storage—especially in this heat! As a general rule, veg should be kept cool or cold. It should not be left out on the counter or it will deteriorate very quickly. Remove the tops of the Carrots before storing them in the fridge in a plastic bag. Scallions should also be kept in a bag in the fridge. Cucumbers and Zucchini should be refrigerated as well, but they don’t need to be bagged. 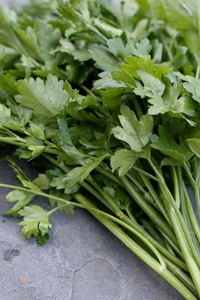 The Parsley is best stored in a bag in the fridge, or in a cup of water (standing up like a bouquet) in the fridge. You can revive limp greens of any kind by submerging the whole bunch in a large bowl of ice cold water for several minutes. 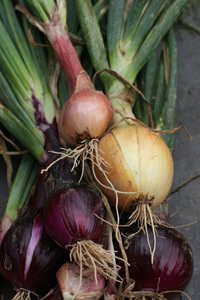 The Walla Walla Onions are fresh (not cured) so they should be eaten soon and stored in the fridge. The onion greens should be removed. And finally, the berries in the fruit share are extremely perishable. They must be kept in the fridge and eaten with a day. We are just starting to harvest our cucumber crop, so the one piece this week is just a teaser of things to come. That said, about 30 percent of our cucumber and zucchini plantings were lost due to flooding in the heavy rains last month. As we mentioned in last week’s letter, our planting and cultivating schedules were set back from June 7th through 20th (typically a very busy planting time) because of the wet field conditions, so some of the crops that would usually be harvested this week are delayed. Good news is that we have a lot of beautiful crops coming your way shortly! These include more cucumbers, green beans, eggplant, bell peppers, several types of early potatoes, basil, garlic, red onions, red and cherry tomatoes and baby watermelons! Tomato Shares are IN! See details below for ordering instructions. Dairy share pick up is weekly. Don’t forget your milk! Pick up your Lewis Waite extras today! Forgot to order? The next deadline is August 19th for delivery on the 23rd. We just got word from our farmers, tomato shares ready for this Thursday! Shares are $35 for 20 lbs. of plum canning/sauce tomatoes. Please deal with Golden Earthworm Farm directly—READ MORE HERE. Weekly dairy share pick up—don’t forget you milk! The next Lewis Waite order deadline is Sunday, August 5th for delivery on August 9th. Anyone, not just CSA members, can order these products and pick up from our CSA. They have an amazing selection of items, all produced by small local farms. Pick up your Lewis Waite extras today! Forgot to order? The next deadline is August 5th for delivery on the 9th. Join your fellow CSA’ers for an evening barbeque at Sunnyside Gardens Park! Bring your friends and family, grilling items and a dish to share. Please RSVP by July 25th. 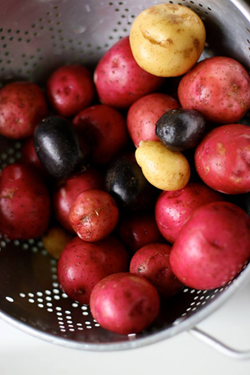 Early bird signup for the Winter Sun Farms 2012-13 winter share season continues online. The total price is $137. Read more and sign up online.